Good morning! It's Tuesday, and that means it's time for another Peachy Keen Challenge. This week it's designer's choice, and that gave me the chance to alter this little wood purse that I picked up at my local Ben Franklin store. I thought it was so cute, and I just knew it would be fun to alter. I was right! While I was shopping around for goodies in the scrapbooking and paper crafting section, I found this GORGEOUS Bo Bunny Snowfall paper, and a whole vintage theme started spinning around in this head of mine. Here's what I came up with, and I hope you like it as much as I do. I don't always "Love" everything I make, but this one ranks right up there. ;-) LOL!!! This is the outside of the box. I simply covered it with a thick coat of glue stick, and I glued the back side of the paper as well. I always have good luck with paper sticking if I apply the glue to both the item I'm altering AND the paper. I used a sanding file to cut the edges of the paper to fit exactly. The remaining wood parts of the box are stained with Tim Holtz distress ink, as well as the edges of paper covered pieces of the box. I cut a snowflake from some of my scraps of paper using the snowflake Sizzix die from Stampin' Up!. I also punched a variety of snowflakes from scraps using my Martha Stewart punches, and both the die cut and all the punched snowflakes were distressed with some Tim Holtz ink. The face for the snowflake was stamped onto a scrap of the patterned paper and I colored it with Copic markers, and added some distress ink to that as well. The sweet snowman face is from the PK-483 Winter Wonderland 1 1/8" face assortment, and the sentiment is from the PK-859 Christmas Greeting Words. Both of those are of course from Peachy Keen Stamps. I finished this project off with a satin ribbon bow, the Tim Holtz hardware, some hand crocheted flowers, and brown and blue flat back pearls. This is a look at the inside of the box, and the bracelet that I made to go inside. This was a project I had SO much fun with, and I can't wait to make more!!! Now, you've got to head over to the Peachy Keen Challenge Blog and see what the rest of our talented designers have made for you! They always have such wonderful things to share, and I know you're just going to love what they have created for you!! Please join me in welcoming our guest designer this week. Palali Biswas has some wonderful things to share with you on her Touch of Creation blog, as well as on the Peachy Keen Stamps Blog. Be sure to visit both this week to see all her amazing work, and possibly win some peachy awesomeness as well!! 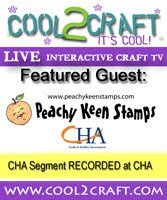 I thank you so much for stopping by today, and I wish you a day filled with wonderful blessings and lots of happy stamping! WOW! This is just GORGEOUS!!! I love the vintage feel and of course the super cute snowman! Lorie, this is absolutely beautiful! I love the vintage look. Everything about it is gorgeous! WOW..WHAT A BEAUTIFUL BAG...IT IS AMAZING...LOVE THE TOUCH OF VINTAGE!! Well I know I LOVE everything you make! You are amazing! This little wooden box is gorgeous! I am so thrilled to have met you in October and hope to do it again someday! It has been such a pleasure being on this team with you! This team really has been like no other! I am happy and grateful you are my friend! This is simply stunning. Wow!!!!!! Lorie, that box is absolutely gorgeous, what a beautiful keepsake. Sweetheart, how can I express the love and joy, knowing you and sharing three wonderful and happy years with you and the Peachy team. you have been my inspiration and my guide. When we got to meet at the Peachy Keen fun house, lol you were everything and more that I'd imagined. We WILL meet again and you will remain a true and favoured friend through thick and thin. I love this project. It's absolutely adorable. Love the rustic look with the PKS. Super cute!